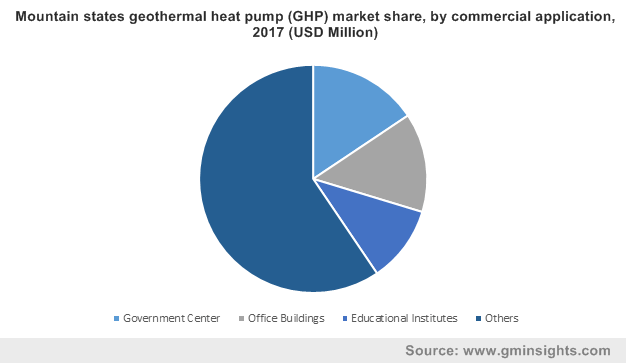 U.S. Geothermal Heat Pump (GHP) Market size was valued over USD 1 billion in 2017 and is set to exceed an annual deployment of 420 thousand units by 2024. Surging demand for sturdy, durable, energy efficient and reliable technology to minimize electricity consumption in commercial and residential establishments will augment the U.S. geothermal heat pump (GHP) market. Growing investment toward residential units along with rising environmental awareness among homeowners are some of the indispensable parameters enhancing the demand for energy efficient system. For instance, geothermal heat pump can reduce electricity consumption up to 44% as compared to the other air source technologies and up to 72% when compared with the electric resistance heating systems. In addition, federal tax credits, green bond, tax rebate and financial assistances are some of incentives introduced by regulators to promote the adoption of renewable technologies. Growing mandates toward the development of renewable technologies for reducing GHG emissions and maintain continuous & clean energy supply will stimulate the U.S. geothermal heat pump market. Several energy-efficiency measures have been introduced by policymakers to achieve the renewable targets and thereby reduce GHG emissions. In 2018, under the Bipartisan Budget Act, tax credits for residential renewable energy system have been renewed and extended through December 2021. 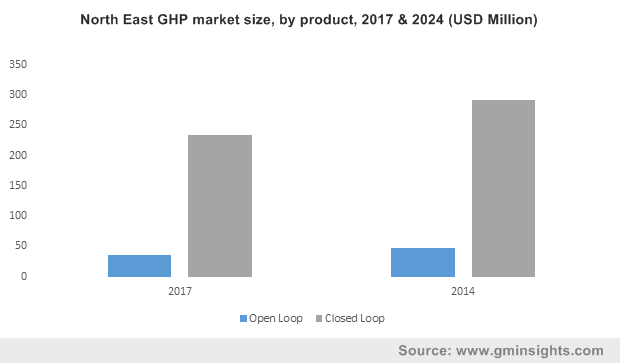 Closed loop GHP market is anticipated to grow at over 3% by 2024 on account of its low operating & maintenance cost and reliability. Ability to circulate antifreeze solution through underground piping loops for transferring the ground temperature to GSHP will make its adoption preferable, thereby stimulating the overall business landscape. Moreover, vertical configuration is preferred over horizontal owing to its less space requirements features. 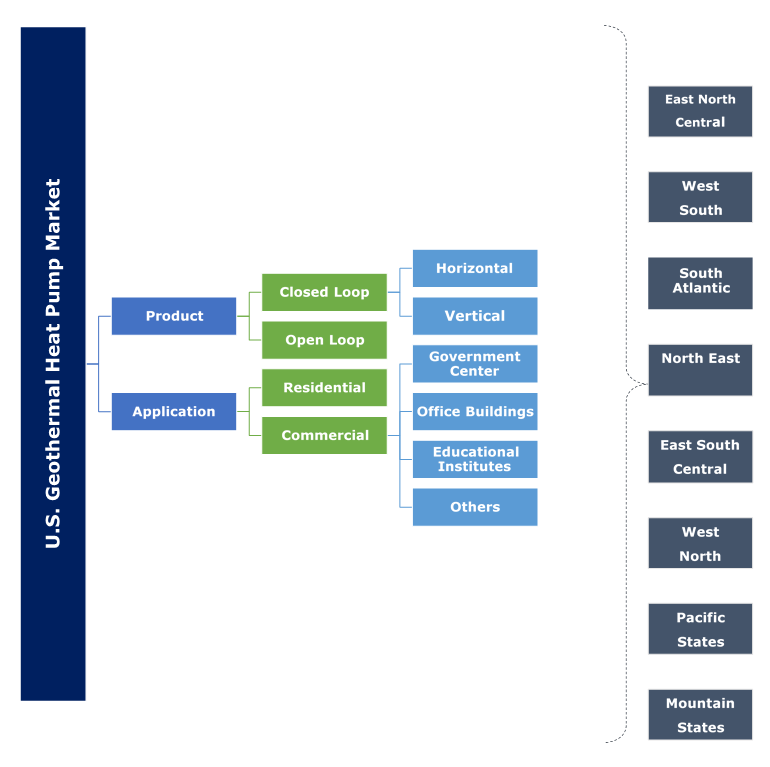 Geothermal heat pump (GHP) market from open loop, will witness growth on account of its ability to reduce heat transfer loss and minimize delay time. Simple design, less drilling requirement, lower installation cost and higher efficiency are some of the key features that will further positively influence the industry outlook. The product finds wide application across tenant finish installation & uses ground water for cooling and heating applications. Residential ground source heat pump (GSHP) market is predicted to expand over 3% by 2024. Increasing investment toward single and multi-housing building infrastructure along with rapid urbanization will stimulate the product adoption. Growing demand for the replacement and revamping of the conventional HVAC system on account of strict energy efficiency norms across developed states will further complement the industry landscape. Commercial GHP market is anticipated to witness growth owing to introduction of several initiatives to promote the adoption of renewable technologies. In 2017, Governor Andrew declared an investment over USD 10 million under the rebate program to promote deployment of renewable heating and cooling system in New York. Furthermore, the program aims to achieve a target to minimize greenhouse gas emissions up to 40% by 2030 from 1990 level. East North Central GHP market size for 2017 was valued over USD 400 Million. Growing demand for energy efficient heating system from commercial and residential establishments across cold climatic region to reduce electricity bills along with volatile fossil fuel prices will augment the business. Strong economic growth along with increasing focus to maintain energy security and reduce carbon footprints will propel the North East ground source heat pump market share. Abundant availability of constant shallow ground temperature primarily in the Scranton/Wilkes-Barre areas will further complement the U.S. geothermal heat pump market dynamics. Notable industry players include Trane, Vaillant, Viessmann, Glen Dimplex, Stiebel Eltron, Bosch Thermotechnology, Danfoss, Daikin, Carrier, NIBE, MODINE, Bryant Heating & Cooling Systems, Bard HVAC, Green Planet Supply Technologies, WaterFurnace, ClimateMaster, Earthlinked Technologies, Spectrum, OCHSNER Warmepumpen, Mitsubishi Electric and Nortek Global HVAC. Technological advancement in the designing of geothermal heat pump (GHP) systems to improve efficiency has been witnessed in the marketplace. In 2018, Dandelion introduced a geothermal system that allows users save on utility bills and cut CO2 emissions. GHP is energy efficient heating or cooling system that circulate heat from or to the ground. The system utilizes a constant earth temperature as a medium of exchange. It finds wide application across residential and commercial buildings for heating and cooling application. Rising focus to maintain fossil fuel sustainability and minimizing CO2 emissions by enhancing renewable energy mix will stimulate the U.S. geothermal heat pump market landscape.